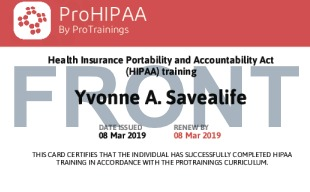 ProHIPAA is training in the Health Insurance Portability and Accountability Act (HIPAA) Privacy and Security Rules. 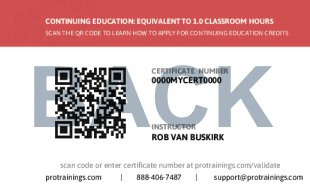 These courses present the most pertinent HIPAA information in a question and answer format with real-life scenarios. Three specific rules related to HIPAA are discussed: the HIPAA Privacy Rule, which protects the privacy of individually identifiable health information; The HIPAA Security Rule, which sets national standards for the security of electronic protected health information; and the confidentiality provisions of the Patient Safety Rule, which protect identifiable information being used to analyze patient safety events and improve patient safety. Total course time includes 35 minutes of video training as well as knowledge reviews, final test, remedial help and reviewing downloaded material. Who is required to comply with HIPAA laws? What are Patients' Rights with PHI?